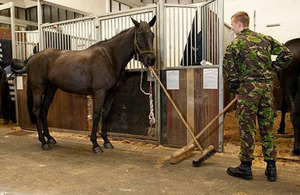 A military horse from the Household Cavalry has taken it upon himself to help muck out his own yard during the morning mucking-out parade. 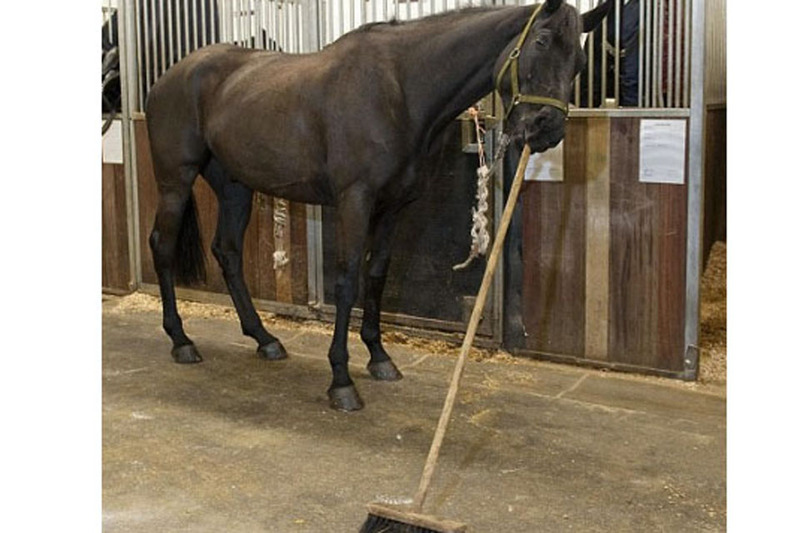 In the build-up to the Queen’s Diamond Jubilee, and one of the busiest years for the Household Cavalry Mounted Regiment (HCMR) yet, black cavalry horse Llamrei clearly thought the boys were being worked too hard and decided to do his bit. As one of the youngest horses in the regiment (aged six) he has only just passed out of training. It was refreshing to see one of the horses pull their weight in the stables. Llamrei has become a troop legend already and he has only just arrived. He showed real selfless commitment the other day. Llamrei, after being broken in and trained during a six-month period by Household Cavalry riding staff, joined the Blues and Royals Squadron simply known as ‘Remount 126’. All the troopers and officers then put their heads together to come up with a name for him. I thought long and hard about naming Llamrei and decided to name him after King Arthur’s charger. So it was rather frustrating when I discovered that the boys, instead of pronouncing it properly as ‘Clam-rye’, have been calling him ‘Sausage’. This summer will be the first ceremonial season for Llamrei and the other youngsters from the ‘L-Reg’ batch. For Llamrei, Longbow, Luxembourg, Lyric and Lucifer, the highlight of the season will be the Queen’s Diamond Jubilee this summer.